1. Full Moon in Leo with Sun in Aquarius: this will be at 0.34am. 2. Penumbral Lunar Eclipse: The Sun, Earth and Moon will be aligned happily. The Earth’s shadow will be on the Moon creating a Lunar Eclipse which will be visible from Europe, most of Asia, Africa & most of North America. It will begin at 10.34pm on February 10, peak at 0.43am & end at 2.53am on February 11. The Moon will gradually turn dark as the Earth’s shadow passes over the Moon and the Sun shines it ray on the Earth, causing the shadow on the Moon. Earth in the middle with Sun and Moon on either side. With the Penumbral Lunar Eclipse we see the Earth’s shadow is on the Moon – how auspicious. This is very grounding and powerful. A very grounding experience. When you see your shadow do you ignore it or do you greet it? Do you play with it or do you talk get angry with it? Are you afraid to look at your shadow? 3. Comet 45P / Honda-Mrkos-Pajdusakova: a few hours after the Eclipse, Comet 45P makes its closest approach to Earth. 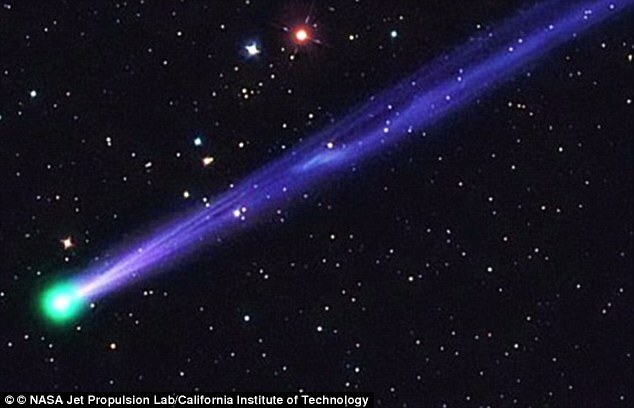 It is known as the New Year Comet. It will be 7.4 million miles away. It will be visible in the sky in the constellation Hercules. Binoculars or a telescope could be helpful. Watch for a bright blue-green “head” with a tail. It will be visible in various points of the night sky until the end of February. It will next be in our skies in 2022. We will be working with the colour GREEN and HERCULES Energy. Along with the lunar eclipse, Comet 45P will make its closest approach to Earth this weekend. The comet makes its way back to the inner solar system roughly every 5 years, and has a bright bluish-green ‘head’. What is so nice is we also have the Jewish celebration of the birth and planting of trees for tithing purposes: Happy Tu B’Shevat. The Comet 45P oozes a green colour and we have the planting of trees – Mother Earth united in Oneness with the Universe and Cosmology. I love it. And man planting new trees. How lovely. And of course, Josei Toda’s Birthday, 1990-1958 (Buddhism). ANNULAR SOLAR ECLIPSE visible in South America and South Africa. 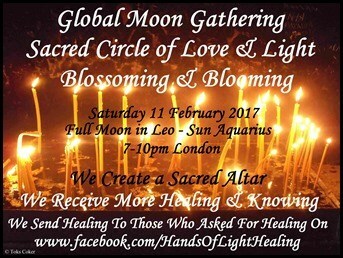 Energy Exchange https://www.eventbrite.co.uk/e/the-new-moon-in-pisces-alchemy-gathering-tickets-29329649772 Book your ticket now to secure your space. The Number 3: Looking back as we entered February we see the first three days of February come in with 3 powerful energies from around the world. On first February we had Vasant Panchami, which begins the Hindu Spring season. On second February we celebrate Setsebun Sai, day before Spring in the Shinto religion. On third February we had Imbolc / Lughnassad, Southern Hemisphere (Wigan/Pagan). What arrangements are you making in threes? This month seems to like threes. Organise things with 3 people, with 3 tasks for each project, etc. As we build up to the run to the Full Moon Eclipse, are you experiencing dramatic feelings and feeling unclear and lost? Great you are entering the Eclipse energy coming with this Full Moon. Do you suddenly feel you need healing and need to see someone for help or do something different to help you get ‘better’, centred and back to yourself? Welcome to this energy of no relaxation and no deep breathes because your fears do not fly away they just seem to visit and stay. There is a feeling of needing to change and not so sure what to do and who to trust. There is also a feeling of grabbing things to do that will ‘fix’ us. What have you ‘grabbed’? A networking event, a new dress, a new friend, an old habit that seems to leave you in a circle? Full Moon Eclipse with Comet does not prepare you for your life at this time. It forces you with sudden change and sudden activities that almost hinder your ‘progress’ or your life. AND YET, you are not sure as you question, as you journey through the LABYRNTH OF YOUR MIND, the real possibilities for you and your happiness. This really is a time to be CONSCIOUS and AWAKE though you many not feel awake or conscious. A true contradiction. So you make an agreement and it all seems fine and then someone comes in with a different point of view and wants to shift the goal post. Do you agree or stick to your guns? Do you get clear about what you agreed and what you want or do you get manipulated, by the energy? The challenge is to see your weakness – maybe show it – but then find your volcano in you – your fire of passion and focus – your volcano voice that speaks with clarity and power and rumbles gently your decision and your spoken words are heard effectively and strongly. You begin to stop feeling pain as you realise that your determination to suddenly feel nothing and then get a clear decision surprises even you! I love the Divine intervention of all this synchronicity happening in your life. Events just happen and they have not discernible causal connection yet they begin to have meaning in your life. 2017 is definitely a different year for us all. So many changes – we have no idea what is coming this year. The Leo Full Moon is a golden Full Moon with many portal gateways and openings and closings. Are you ready for your change? Are you ready for your transformation? Are you ready for your shift? Are you ready to be carried by the flow of the Energy of Now or are you going to resist? So what do you notice you are ending or closing the door on? What will you be opening to? With an ending always comes a beginning. What surprises have you had leading up to the Eclipse? What surprises during and after? A time to nice surprises and shocks as we move into the energy of the eclipse. How will you cope? I love the numerology of 11 and the date 11 February for the Eclipse. I am finding that even if you do not like were you are, you have to face were you are. You have to do the journey and go through the TUNNEL OF YOUR MIND. I am looking forward to hearing your experiences. Please share them. What ACTIONS and RESULTS are you manifesting with this Full Moon? What is showing up for you really in your life. Really go through the bumpy ride and make sure you have your seat belt on. Safe Journey. Time to really see your truth and your life. Walk around and look around you and say – I Am That Everywhere you look is God / Divine. Say: I AM That – that is. Thank three people you know personally – not your family or blood. For example, I was guided just before the Full Moon Eclipse and Comet to give three people at my doctor’s surgery who have looked after me for a few years. I went to Marks and Spencer and bought three different types flowers for each person. When I handed them the flowers they could not believe that I had chosen exactly what they would like. I took pictures of their smiling faces holding the flowers. 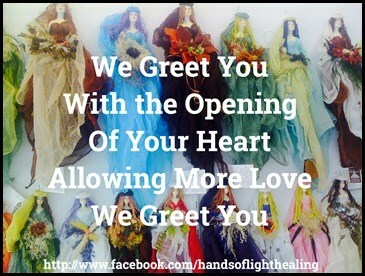 You will each picture being used under an Invocation Blessing. I felt so happy when I was walking home – like I was floating. Write down a list of all the shadows in your life: all the fears that eclipse your feelings of being joyful; all the people, events and feelings that get you down or make you feel you’re not loved or protected or happy enough. Stand outside under the moon at the start of the eclipse (22.34) and light the paper making sure you burn all of it. Take the ashes and smear them on your third eye as a reminder to yourself that you have let these all go. Write down a list of all the things you are grateful for in your life. Write down a list of all the the things that have manifested in your life over the past 2 weeks. ‘I invoke thankfulness (pause & really feel it in your heart), appreciation (pause & really feel it in your heart) and gratitude (pause and think back to everything on your lists above and feel the gratitude in your heart). Write down what you were doing 5 years ago when this particular comet last visited us. And what significant events, ‘good’ and ‘bad’ have happened in your life since then. ‘I am grateful for all that has happened to me, good and bad, as both have brought me to this moment in my life right now.’ And close your eyes and really see and feel how the so called bad things made you make changes that have brought you to new places inside your self and in your world. Then place this and your full moon lists in a special envelope, seal it and write on it: ‘Only To Be Opened in Feb 2022’ and give it to someone you know will keep it safe for you till then.